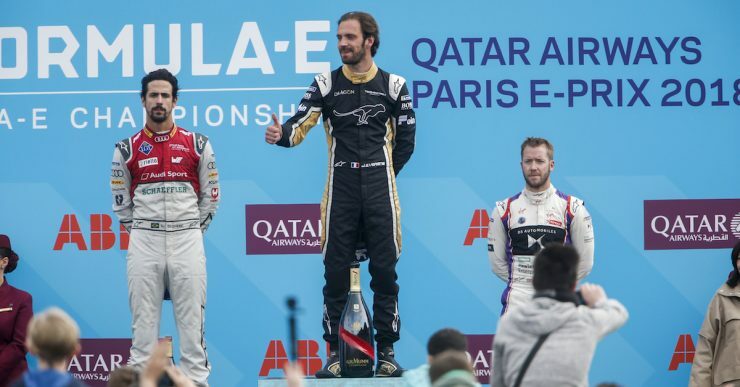 Jean-Eric Vergne drove a flawless Formula E race from pole to flag to win the Paris ePrix in front of his adoring home fans and extend his championship lead. The Frenchman, who hails from Paris, held off early pressure from title rival Sam Bird before a most dramatic Paris ePrix finish saw Lucas di Grassi steal second and Bird cross the finish line on three wheels as Andre Lotterer, running third, ran out of power and the Englishman was unable to avoid contact. Maro Engel and Renault e.dams driver Sebastien Buemi took advantage of Lotterer’s late misfortune to finish behind the top three as Daniel Abt, Felix Rosenqvist, Oliver Turvey and Jose Maria Lopez rounded off the top ten. Vergne made an excellent start, holding his pole slot into the opening corner as Bird squeezed out Lotterer to hold second. Behind, early drama unfolded – Tom Blomqvist slamming into the back of Nico Prost’s Renault e.dams bringing out the full course yellow as Ma Quing Hua failed to get away from the grid. It was a tough break for the popular Frenchman on his home circuit, the damage forcing him to pit for a rear wing and out of contention for a points finish. Abt was a man on a mission, the young German making several places in the early stages to charge from 14th to eighth place by lap 10. Out at the business end of proceedings, it looked as if this would again be a battle between title contenders Vergne and Bird. But despite the Englishman conserving more energy than the leading Techeetah machine, he was unable to find a way past before the crucial stops. The leading three of Vergne, Bird and Lotterer entered the pits nose to tail and, crucially, it was the Frenchman who emerged ahead with a quicker change of cars. And with Bird’s energy dwindling, first Lotterer then di Grassi passed the Englishman on lap 35. It looked as if that would be the way it would finish but for the late drama involving Lotterer.